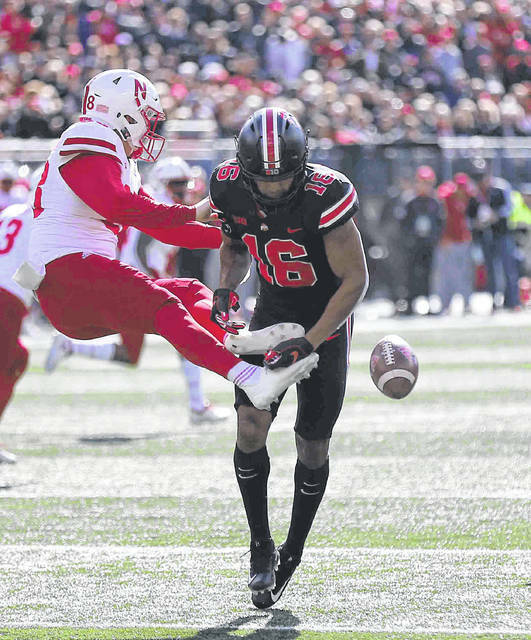 Ohio State’s Jonathon Cooper, left, and Malik Harrison close in on Nebraska’s Adrian Martinez during Saturday’s game at Ohio Stadium in Columbus. 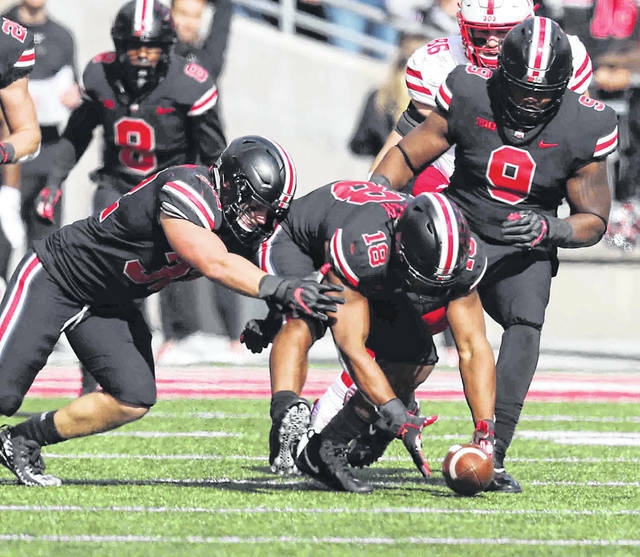 Ohio State’s Jonathon Cooper picks up a fumble as teammates Tuf Borland, left, and Jashon Cornell close in during Saturday’s game against Nebraska at Ohio Stadium in Columbus. Ohio State’s Dre’Mont Jones sacks Nebraska’s Adrian Martinez during Saturday’s game at Ohio Stadium in Columbus. Ohio State’s Keandre Jones blocks a punt by Nebraska’s Isaac Armstrong during Saturday’s game at Ohio Stadium in Columbus. 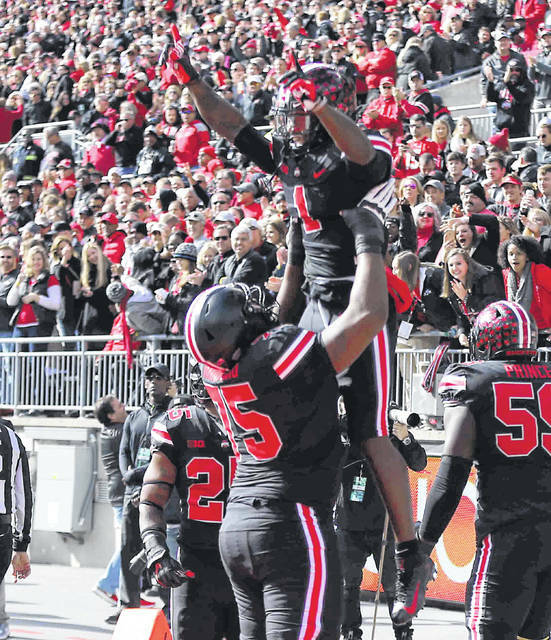 Ohio State’s Johnie Dixon lll (1) celebrates scoring a touchdown with Thayer Munford during Saturday’s game agaiinst Nebraska at Ohio Stadium in Columbus. Ohio State’s J.K. Dobbins dives for a touchdown against Nebraska’s Deontai Williams (41) and Tre Neal during Saturday’s game at Ohio Stadium in Columbus. See more Ohio State photos at LimaScores.com. 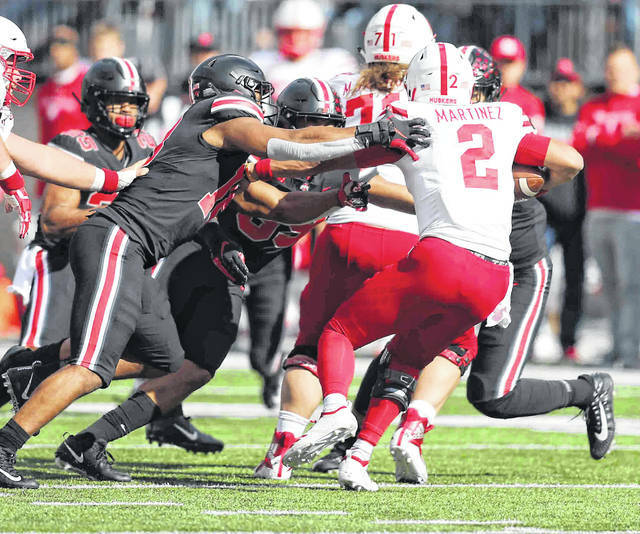 COLUMBUS — The biggest story in Ohio State’s 36-31 win over Nebraska on Saturday was the return of the Buckeyes’ running game. The biggest question after the game, though, was if the Buckeyes are back to where they expected to be with this win or if they still have a long way to go. 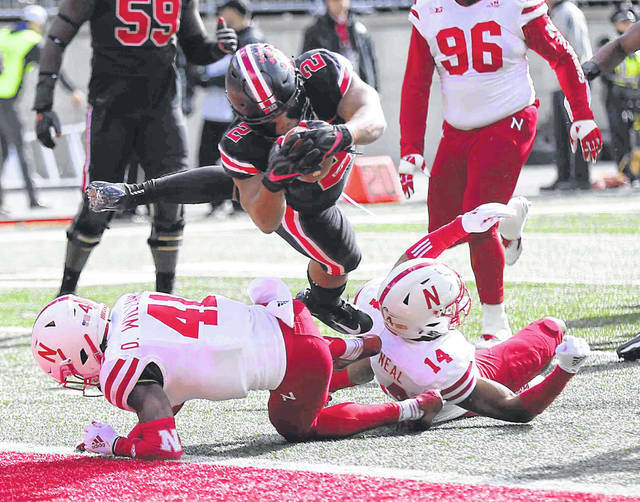 J.K. Dobbins rushed for 163 yards and three touchdowns and Mike Weber had 91 yards when OSU achieved some much-needed balance on offense after rushing for fewer than 100 yards in its last two games, a 49-20 loss at Purdue and a 30-14 win over Minnesota. No. 10 Ohio State (8-1, 5-1 Big Ten) could talk about running over people and imposing its will all day but there was nothing easy about its win over Nebraska (2-7, 1-5 Big Ten). Nebraska led 21-16 at halftime and OSU didn’t take the lead for good until Dobbins got the second of his three touchdowns on a 3-yard run to put the Buckeyes up 23-21 with 5:39 left in the third quarter. After jumping out to a 16-7 lead late in the first quarter, Ohio State went 26 minutes without scoring between Dobbins’ first TD and his second. And even after seeming to put the game away when Dobbins scored his third touchdown on a 42-yard run for a 36-24 lead with 4:52 to play, the Buckeyes watched the Cornhuskers use less than two minutes to cut the lead to five points with 2:57 left on the clock. But even Meyer seemed undecided about whether Ohio State righted the ship with Saturday’s win. But then he reversed course and said, “I do, I think we’re close. We better be when you see what’s coming up next week (a game at Michigan State). But I liked the effort today. “The biggest thing was to get that darned bad taste out of your mouth from a couple weeks ago (the loss at Purdue) and go win the game,” he said. Quarterback Dwayne Haskins, who had been asked to carry the offense recently, was not at the top of his game. The sophomore QB threw for 252 yards and two touchdowns but threw an interception and lost a fumble when he was sacked. And receiver K.J. Hill lost a fumble after a catch. “The passing game wasn’t as sharp today,” Meyer said. 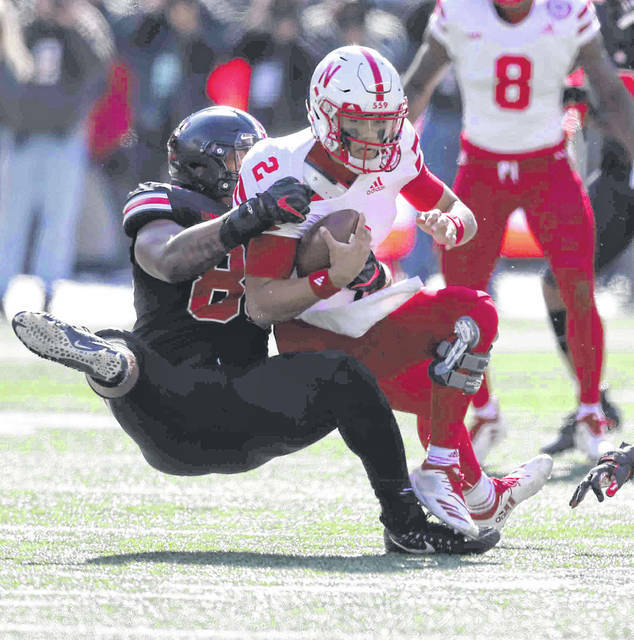 OSU’s defense avoided its season-long problem with giving up big plays for most of the day. But its barely outgained the Cornhuskers, 481 yards to 450 yards. Meyer defended his beleaguered defense by pointing to three lost fumbles, two of them by Weber, and having to play without cornerback Jeffrey Okudah (groin injury), safety Isaiah Pryor (shoulder injury) and safety Jordan Fuller (ejected for targeting in the first half). Fuller’s ejection meant sophomore safety Brendon White got the most playing time in his career and he responded with 13 tackles, which tied Malik Harrison for the team high. “We’re nowhere close to where we need to be (on defense). But they improved,” he said. The question remains, though, if Ohio State can improve enough to play for a Big Ten championship and maybe something beyond.